Kamath's Paradise: First ever artificial ice technology used in India! First ever artificial ice technology used in India! Hi friends, I am dedicating this blog post to Late Rajiv Dixit who left this world for ever. He has kept National interest above all and till his last breath traveled length and breadth of India to educate people about the importance of Nationalism. He is a proud son of Mother India and she lost one of her brave soldiers. Today evening I was watching a recorded speech of Late Rajiv Dixit in an Indian TV Channel Samsakar and am surprised to hear what he was telling. He was listing out the contributions of Indians in the field of science and technology. He told, the first ever artificial ice was produced way back in 6th century in India, contrary to the belief that it was produced in 18th century in Europe. Though plenty of ice is available in nature, technology to prepare ice was not known for many years. Chakravarty samrat Harshavardhan who ruled India in 6th century AD was basically a scientist and his specialization was chemistry. One day his son became ill due to very high fever and nobody could find any remedy to bring down the fever. The Doctor who was treating the patient requested Harshavardhana to arrange some cold material so that body temperature of the child could be brought down. Since natural ice was not available in that area, Harshavardhana used his scientific skill and prepared the first artificial ice pieces by human being and saved his son’s life. The scientist turned ruler knew the exact combination of temperature and pressure to convert water to ice. Historical biography of King Harsha in Sanskrit,Sri. Hars ha Charitra by Banabhatta is a source of information to justify this historical fact. This post is a humble tribute to that departed soul who was always trying to make us feel proud about our mother land by highlighting its positive aspects with facts and figures. Thanks for the information. Let his soul rest in peace. Its a delight to know about people like this. May more people like Rajiv Dixit grace our soil and remind us about our great heritage. A wonderful piece of information....Sir....thks for bringing it to light..
You did the right move- to give this space as a tribute to a good man, who made your motherland proud of his invention and good works. 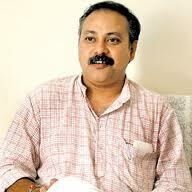 Rajiv Dixit now smiles down in grace and peace with the Lord. Rajiv Dixit ji type of people are true incarnations of God. His demise is a huge loss for our nation. We will take forward his dreams . His efforts will be answered. Thanks to you for this informative post which made me feel proud of my Nation and Patriots like Rajiv ji. Wow ! This is really news.Will share this blog post now.